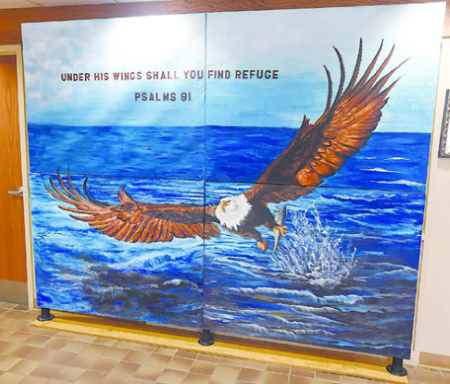 The mural is a large painting on the third floor of the Findlay municipal building that has a Bald Eagle swooping over water with the quote “Under His Wings Shall You Find Refuge Psalm 91”. Lydia Mihalik: You know at this point we haven’t been given anything by anyone with legal authority that tells us that the mural has to be removed. It was a gift that was given to the community several years ago and it’s been in that location ever since I’ve been mayor and it’s something that we celebrate we don’t necessarily know when we do not find it offensive at all. And so at this point in time it’s going to stay right where it is. It doesn’t matter if you don’t find it objectionable or if 99.9% of the citizens of Findlay didn’t find it objectionable. The 1st amendment is meant to protect minorities from the tyranny of the majority. 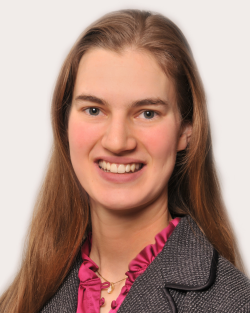 FFRF’s letter was written by a staff attorney well versed in constitutional law. Like the ACLU, FFRF doesn’t take church and state issues lightly and would only send a letter if it felt it could win in a court room. Most governments and schools who get such a letter comply with the constitution and remove or modify the church and state violation. TV Host: It’s beautiful it’s a beautiful reminder too. So who has a problem with us. 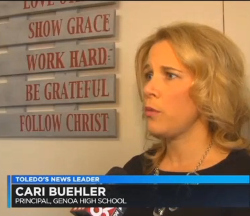 Lydia Mihalik: You know the Freedom From Religion Foundation sent us a letter a couple of weeks ago that demanded that we take the painting down. I don’t know if we’re going to receive another letter after we’ve basically said that we’re not removing it. I think it’s basically a distortion of the First Amendment. I think their belief in that we are endorsing a religion here with this particular painting is wrong and so at this point we have a lot of people who are supporting what we have here in this community. And so we’re going to continue to have it up in the building until we’re told to do something different. When a government accepts a donation of art work it IS endorsing the message that art is expressing. This isn’t any different than erecting a Nativity Scene at Christmas time. If you don’t include secular items in a Christmas display then the Nativity scene has to go. The better action would be to stay neutral and cover up the quote or remove the mural entirely. TV Host: OK we reached out to the Freedom From Religion Foundation. This is what they said. Non Christians shouldn’t have to be subject subjected to the sectarian message in order to come to the building. What is your response Mayor. Lydia Mihalik: You know I think everyone’s entitled to their opinion. There are a lot of things that I encounter on a daily basis that I don’t necessarily agree with but that doesn’t mean I’m asking people to take them down. You know we have very many people in this community that practice very diverse religions and have faiths and beliefs in a higher power. And we should celebrate that. And it’s not something that I’m in a position to apologize for. I’m glad she isn’t roaming through town demanding people take stuff down she doesn’t agree with. As private citizens we are free to complain about stuff we disagree with and ask that things be taken down. However if you do it as Mayor, or another city worker, then there would be a problem especially if it was based it on their own religious beliefs and not the current laws on the books controlling time, manner, and place. 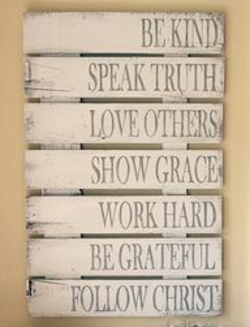 Artwork, statues, plaques, or other kinds of decorations used in government buildings require special examination because the state isn’t suppose to cheerlead for religion. 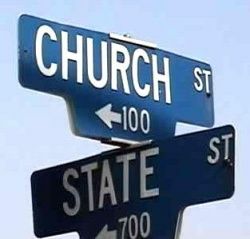 I find it interesting when religious people want government to celebrate religion it is always Christian. When governments have been to told to include all religions (and the non-religious) the government almost always decide to turn neutral. Lydia Mihalik: And I say yes the more the merrier. If there are other groups that want to have artists put together paintings that depict something that’s representative of a different religion other than Christianity, I’m okay with that. So the Mayor of Findlay is offering the municipal building to host art work celebrating your religion or none at all. Let her know that Secular Left sent you.